NEW YORK, New York, February 9, 2015 (ENS) – The World Health Organization has recorded a surge in new Ebola cases this past week, ending a series of declines that saw the number of new cases in the three hardest-hit countries – Guinea, Liberia and Sierra Leone – fall below 100 a week for the first time in seven months. Even so, UN officials say the response to the Ebola epidemic has now moved to a second phase, shifting from slowing transmission to ending the epidemic, which began March 23, 2014 when WHO’s African Regional Office reported an outbreak of Ebola virus disease in Guinea. 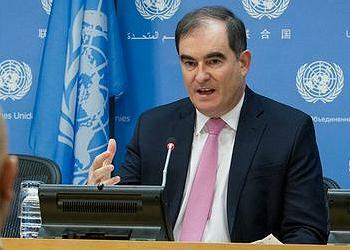 The international community’s mobilization in the global Ebola response has been “very impressive and effective” but efforts to reach zero cases must continue unabated, John Ging, director of operations for the UN Office for the Coordination of Humanitarian Affairs, told reporters at a briefing in New York Thursday. “While remarkable progress has been made, we must not forget that it only takes one new case to start a new outbreak,” he stressed. Case incidence continues to fall in Liberia and Sierra Leone, although Guinea reported 30 confirmed cases in the week to January 25, up from 20 confirmed cases in the previous week. There have been more than 22,000 reported confirmed, probable, and suspected cases of Ebola in the three intense-transmission countries, with almost 8,800 deaths. Outcomes for many cases are unknown. The case fatality rate among all hospitalized cases is between 54 percent and 62 percent in the three countries, with no indication of an improvement over time. 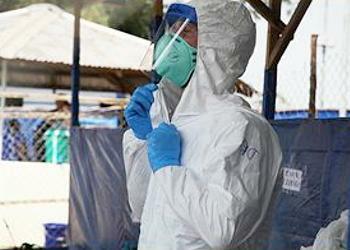 The Ebola outbreak has produced wide circles of victims beyond the infected and the dead. Survivors, families, children, and health workers are dealing with the stress and trauma of the disease. Hundreds of health workers coping with the disease have been infected. A total of 816 health worker infections in the three countries have resulted in 488 reported deaths, according to the World Health Organization, WHO. Health workers have done, and continue to do, long shifts attending to too many patients while witnessing their colleagues’ deaths and working under a lot of fear and stress,” says Florence Baingana, a mental health specialist for WHO Liberia. Just back from the Ebola-affected region, Ging said emergency health workers had undertaken “heroic” efforts in educating communities and treating Ebola patients humanely. Now, as optimism among Ebola responders grows, a shift towards recovery is taking place, with efforts focusing on sending children back to school and rebuilding local economies that were devastated by the epidemic that broke out just over a year ago. Oxfam is calling for a “multi-million dollar post-Ebola Marshall Plan” to put the three West African countries hit by the deadly disease back on their feet. The international nonprofit aid agency says its researchers in three Liberian counties found that 73 percent of families have seen their incomes decline, with an average income drop of 39 percent. Lost income means less food. Oxfam found 60 percent of people said they had not had enough to eat in the past seven days. One in four said this was due to a decline in income, one in five said because of high food prices. People have been relying on the generosity of friends and relatives, choosing less expensive food, limiting portion sizes, reducing the number of meals eaten a day and restricting adult consumption so that children can eat. Oxfam is calling for an international pledging conference to agree recovery plans backed by generous support from rich countries to help efforts to rebuild lives and put the economies back on the road to growth. Since the Ebola outbreak the World Bank estimates nearly 180,000 people have lost their jobs in Sierra Leone and in Liberia half of heads of household are out of work. In Liberia, the World Bank found that job losses fell disproportionately on women with more women losing their jobs than men. The loss of income is exacerbated by rises in the price of food. In Liberia the price of rice has risen 40 percent above its seasonal average. Poverty rates in Ebola-hit countries were already high before Ebola struck. In Sierra Leone 56 percent of the population were living under the poverty line, some 64 percent were under the poverty line in Liberia and 40 percent in Guinea. Before the Ebola crisis, Liberia and Sierra Leone were two of the fastest growing economies in Africa with annual growth rates of over five percent for Liberia and a staggering projected growth rate of 11.3 percent for Sierra Leone. Both countries were coming from a low economic base due to years ravaged by war. Guinea’s pre-Ebola projected growth rate for 2014 was 4.5 percent. Oxfam says the key to the success of any recovery package will be immediate cash for millions of families affected by the crisis, investment in jobs, and budget support for health, education, water and sanitation. Oxfam is planning to increase its work to help communities recover from the crisis with cash grants to vulnerable families and work to rehabilitate water and sanitation facilities. 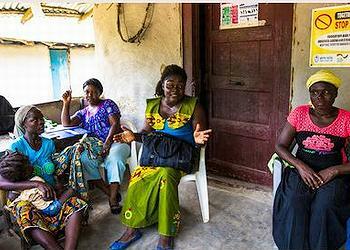 Responding to the Ebola crisis, Oxfam has helped 650,000 people in Sierra Leone, 445,000 in Liberia, and 33,000 in Mali. It has helped a further 15,000 people with preventative work in Guinea Bissau, Gambia, and Senegal. WHO says scientists believe that fruit bats of the Pteropodidae family are natural Ebola virus hosts. “Ebola is introduced into the human population through close contact with the blood, secretions, organs or other bodily fluids of infected animals such as chimpanzees, gorillas, fruit bats, monkeys, forest antelope and porcupines found ill or dead or in the rainforest,” the UN health agency says. Ebola then spreads through human-to-human transmission via direct contact through broken skin or mucous membranes with the blood, secretions, organs or other bodily fluids of infected people and corpses, and with surfaces and materials such as bedding and clothing, contaminated with these fluids. In early December, Liberian President Ellen Johnson Sirleaf urged her people to travel the last mile to reduce Ebola cases to zero. That last mile will be very long and difficult, she said. It can only be achieved when every county has the capacity to find and isolate all cases, trace all contacts and bury safely all who die from Ebola.